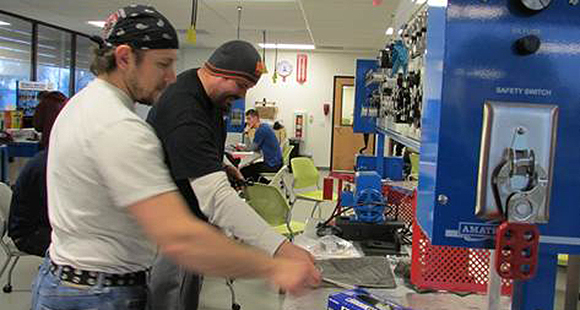 The California Economic Summit recently announced that three regional public-private partnerships connecting employers and education who are improving California’s workforce training and will be honored at the 2017 Summit next month in San Diego. One of the winners is the InTech Learning Center, a workforce training partnership between a steel manufacturer and a college, both located in the Inland Empire. We interviewed Sandra Sisco, the Director of Economic Development at Chaffey College about the effort. CA Economy: Briefly tell us who came up with the idea of the partnership and how did you organize it? Sandra Sisco: Our industry-educator partnership was formalized 16 years ago with the formation of the Manufacturers’ Council of the Inland Empire (MCIE). The manufacturing industry reached out to Chaffey College seeking help to establish an accelerated craft training program. As the program matured, MCIE members concluded that industry would benefit from a regional training center. Chaffey College received a $14.9 million Trade Adjustment Assistance Community College Career Training (TAACCCT) grant from the US Department of Labor (DOL). The Inland Empire Regional Training Consortium was formed under the TAACCCT grant and consists of 9 colleges, two universities, and both San Bernardino and Riverside County Workforce Development systems. A portion of the grant funded the renovation of a 33,000-sq. ft. building located on the California Steel Industries (CSI) property. CSI donated this building to the consortium to be used as a regional training center: the InTech (Industrial Technical Learning) Center. Who was in your partnership and what were you trying to achieve? Manufacturers were seeking help to establish a craft training program scheduled in a convenient format which would train workers in common skills shortages identified by industry, and as this program continued to grow and flourish, it was recognized that industry would profit from a regional training center. Manufacturers who are members of the MCIE include SteelScape, Brithinee Electric, California Steel Industries (CSI), Vista Metals, California Portland Cement, Cott Beverages, Ventura Foods, Tamco, TST, and Celestica, just to name a few. Additional partners include the San Bernardino and Riverside County Workforce Development Departments. Our training programs offer industry-recognized, stackable credentials, which lead to high-wage, high-skill occupations for our students. Our outreach team “job matches” graduates with employment opportunities. We serve all populations at all levels—funding is not restricted to just low-income participants, youth, etc. We assist incumbent workers, new entrants into the workplace, and those with no skills or intermediate skills, so training is delivered at all levels of the career spectrum. As we upskill incumbent workers, they move up in their companies, and leave more entry-level positions open for our graduating students entering the workforce. Our pathways are scheduled in a flexible variety of modalities so that the greatest number of students can find a pathway that suits their availability; pathways also feature multiple “onramps” and “offramps” to best accommodate students and set them up for success. We also offer tutoring to help our students with the academic rigor in our programs. How have you and other employers benefited? The long-standing dream of opening a regional training center was finally made into a reality with the award of the TAACCCT grant. But the relationships that made this possible have been in place for more than 20 years. Now employers can send their current employees to training in a convenient location where parking is easily accessible and the training program is top-notch. We have the ability to schedule classes in a flexible format that fits the availability of workers to attend training. We are also becoming the “go-to” when our area employers have hiring needs. Employers can conduct recruitment, assessment testing, and other hiring events at our site, and our career services team can pre-screen and refer vetted, well-qualified applicants. We have also incorporated professional “soft skills” into our curriculum in addition to technical skills to increase employee retention and performance in the workplace. Finally, for the last 6 years the CA Economic Summit has been working on making workforce preparation an imperative. What can other employers and educators learn from your partnership? Chaffey College and the InTech Center are known for listening to employers and then responding to industry needs, whether that be curriculum development, training delivery, hiring needs, internship and apprenticeship opportunities, or obtaining funding for training and special projects. The other element that has allowed our partnership to flourish is the formal structure of the MCIE providing a forum for program development and a platform for open and clear communication between the colleges and employers. By working closely with our county workforce development agencies, we leverage each other’s resources to benefit our employers and students with on-the-job training and WIOA funds which can pay for employee wages and student supportive services, like book and transportation assistance. Lastly, having a “champion” employer who is truly prepared to put “skin in the game,” like CSI, has been critical to our success. In addition to allowing InTech to recruit instructors from the CSI employee pool as subject matter experts, CSI also used $1.9 million of its own investment to renovate the InTech Center building and leases it to Chaffey College for only $1 per year. The California Economic Summit will be held in San Diego November 2-3. California’s major gubernatorial candidates and the three leaders of the state’s higher education unit are among those scheduled to attend. To register for what has become the state’s top economic event, click here.